This complex print was created for a calendar for the year Meiwa 2 (1765), the designation of which is hidden in the frame of the screen. 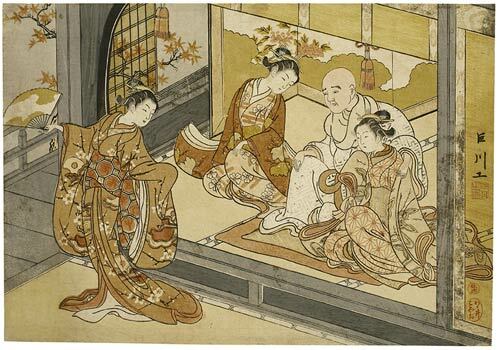 In this masterful print with understated colouring, Harunobu transports the historical model into the modern period: the girls are wearing the clothes and hairstyles of their time, while the room in the palace and General Kiyomori are depicted in the style of the Heian period. This exquisite calendar print, one of the masterpieces of the Riese collection depicts the climax of a poignant tale. Kiyomori, the Heike leader who had risen to be ruler of Japan, was deeply in love with his consort, Giō. So much so, that when reports of a beautiful young dancer, Hotoke Gozen, reached the court he refused to allow her to dance there. Giō interceded, insisting that the young woman should be given a chance. Kiyomori was so smitten with the dancer’s grace and charm that he abandoned Giō. Hotoke Gozen became Kiyomori’s consort for a time, but finally left to seek Gio and make amends to her for her kindness, the two of them eventually taking religious orders. Kyosen was the leader of the circle of poets and connoisseurs who commissioned the first calendar prints in the spring he suggested to Harunobu the idea for the design. Kyosen designed a few curious prints himself but although unsigned, this print has always been attributed to Harunobu. The date is written on the edge of the screen behind and the months, divided into long and short, are written on the binding of the bamboo curtain on the right and on the dancer’s sash. One other impression of this print is known, formerly in the Michener collection (Art Institute of Chicago, p.15, no. 28). It is one of the miracles of the history of art that with no obvious precedent, full colour printing appeared in the spring of 1765, and within the space of a few months at the most, dozens of designs appeared which were printed with every elaboration, delicacy, and refinement available to the medium, as in the print of Kiyomori here. Riese, Asiatische Studien, 1972, p.81, no. 8.